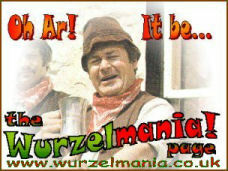 Sil Willcox was approached to manage The Wurzels in the early part of the the new Millennium. Legend says that he was sitting at his desk in a former hayloft when EMI called - they had heard that he ran a management company from a farm in the West Country and thought it was rather suitable. A local Somerset lad, Sil had been in various bands as a young man before making the move into management with The Stranglers. Sil runs Cruisin' Music, a management company representing The Stranglers, The Wurzels as well as The Bluetones, Tina Cousins, Amsterdam and Saturday Morning Pictures, and he has been responsible for breathing new life into The Wurzels, and getting them back into the charts where they belong! In 2007 Sil expanded his running, by completing the London Marathon to raise money for BUI Prostate Cancer Care, Tommy Banner's pet charity. Until recently Sil lived and worked from his music studio and offices in a converted farmhouse in Falkland near Bath - within easy staggering distance of the famous Tucker's Grave cider pub; however over the winter of 2008-9 he relocated to France to build a new strudio setting there - although, as the song goes, he'll never get a scrumpy there!